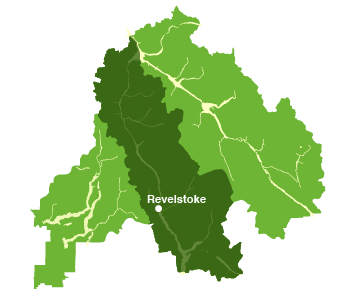 Electoral Area B (Revelstoke Rural) is the rural area surrounding the City of Revelstoke. The unincorporated communities within the area are Trout Lake and Galena Bay. The area offers residents and visitors scenic vistas of the Selkirk Mountains, Arrow Lakes and the Columbia River. The area is renowned for its world-class cat, heli and backcountry skiing. The Canadian Pacific Railway and BC Hydro are important economic Drivers for this area. The forestry sector continues to be the major industry. There are currently no Parks & Trails posted for this area.